The highlight though is the Sophie Hulme envelope clutch. I turned around from the Jimmy Choo shoe section in Harvey Nichols and immediately clocked it and the adjacent sign that told me it was 50% off. I really felt like the retail Gods had aligned and were directing me to purchase. It is a clutch but the addition of the strap means that I can use it as a regular cross-body/shoulder bag. It even fits a laptop which makes it practically perfect. Sophie Hulme has been on my hit list for a while. I love that combination of great leather, classic shapes and statement hardware. The fact that it's also a brand that you do not see on everyone/everywhere is another factor that adds to the appeal. I have been considering buying what I call the "Vivianna" bag but am waiting to see if it comes in a beige or dove grey with gold hardware and then I'll review. Now the only sales shopping I am thinking about is this dress from River Island. I really hope this goes on sale. I have seen it in Dubai but such is the markup on clothes here, instead of costing £50 it costs closer to £100. As nice as it is there is NO way that I would spend that much on it so I am keeping my fingers crossed for a bargain! Are you planning any sales shopping this summer? What a stunning bag! The colour looks great on you! It is absolutely gorgeous! I've not got any plans to go shopping yet, I'm more of a winter sales fan as that's the stuff I wear more! love the simplicity of the dress and that pop of pink is gorgeous ! The Sophie Hulme bag is amazing, it's been on my hit list for a while too but it's gone up a few notches now you've told me it fits a laptop!! Looking gorgeous as always!! Oooh I tried that dress on when it came instore a few weeks ago and instantly loved it! hope it goes on sale here too! There's a few other things I have my eye on too! I'm in love with that clutch! The pink is such a bold pop of color. What a beautiful bag! Although, I'm surprised they try to pass it off as a clutch when it can fit a lap top! Great sale finds Laura! You'll be surprised at how much you use a bright pink bag - I have the Saint Laurent mini sac du jour in lipstick pink & use it so much! You look gorgeous, love that pink bag. If you get the chance, join my linkup today to share your amazing post. Looking lovely Laura. I have been trying to resist the Harvey Nics sale all week but now I've seen this clutch, I may have to go for a little (planned) impromptu shop. That bag is so damn gorge!! that bag is amazing and so handy with the strap! What a gorgeous bag, that colour is amazing! Love the dress, especially the sleeves! very boho chic ;) Ahhh sales...anything topshop or skincare would be great!! I need me some more mom jeans!! that dress is stunning, especially with the colour of that bag! 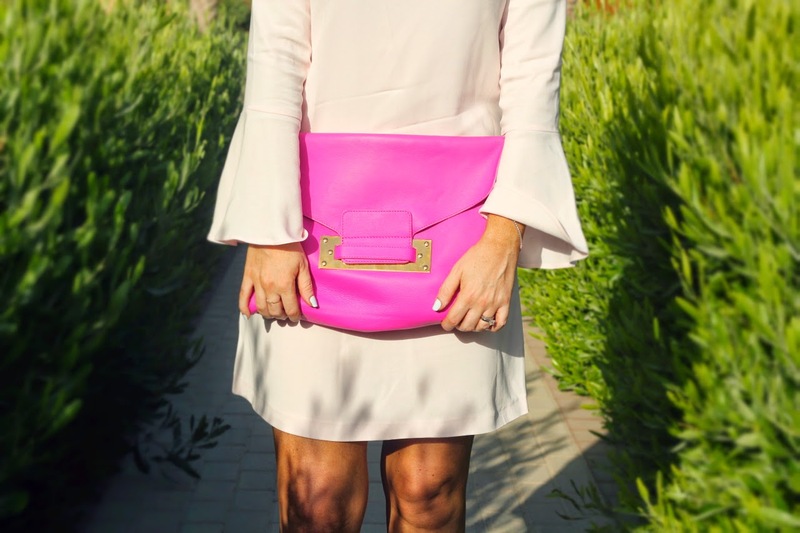 I love the magenta clutch! It's gorgeous. I can see it paired with sky blue skinnies. On another note, when are you going to start making videos again on You Tube? Nice post. Browse rings designs online.